One of the hardest concepts to get in EDH is the Command Zone as it’s not really played in “normal” Magic. So, what I’ve done, is made a video about the Command Zone. Yes, that’s right, we’re doing videos now. No, this does not mean we’ll do videos all the time, but for certain things we will. After this video, I’m working on the Partial Paris Mulligan as well. If we get a big game going or want to show something that would be better on video then to write it, we’ll go that route. So, without further ado, here’s the first of a series of videos: The Command Zone. While it’s a little straight forward, I’m still trying to find my place with what to do with videos for EDH. In the future there will be a little more humor and a little more people besides me. The casting cost of your General is equal to [2 colorless mana]x[number of times cast from Command Zone]+[General’s casting cost]. This is why it’s always the casting cost of the General the first time you play it (x = 0). Should your General gets returned to your hand, you can cast him/her as a normal creature (but it still has the Command Zone clause). While your General can go to the Command Zone if he/she gets exiled or killed as a replacement effect, you can’t have it go there if your General goes to your library (Condemn, Temporal Spring, etc) or to your hand (bounce). If anyone was confused about the Command Zone before, hopefully this will clear it up a little. If it hasn’t, sound off on the comments below. For a piece I’m doing next week about Pimping your EDH deck, I need more evidence. 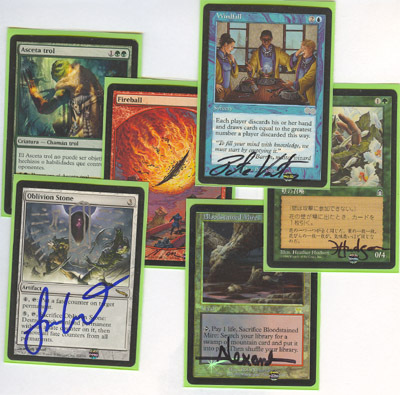 Pimp Magic cards = Foil, foreign, signed, or altered cards. I’ve got some pics already but I want more. You want your awesomeness shown on this page, send me pictures (99ehdproblems @ gmail.com). Brag to your friends and other anonymous people online (please note: this is for EDH decks only. Don’t just send me a pic of your Vintage goodness). This entry was posted on Tuesday, December 8th, 2009 at 1:27 pm	and posted in 99EDH Video, EDH, Magic: the Gathering. You can follow any responses to this entry through the RSS 2.0 feed. The video intro is pretty epic 😀 Hope you do more, because it definitely adds a new dimension to the blog. I personally like to “tap” my general when (s)he is in the command zone. I also leave exiled cards in my graveyard, but “tap” them to differentiate. It saves table space, and helps me reconstruct previous turns.